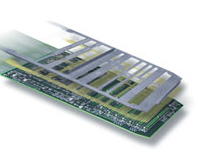 PCR Technologies, Inc. offers heatsink to circuit board bonding (PCB/PWB bonding) utilizing conductive adhesives, sweat solder bonding (vapor phase) and ESD for populated SMT assemblies. By means of bonding and laminating, and through command of working with pyralux, ablefilm, thermabond, cybond, nitro phenolic, kapton, and wet lay-up epoxies, we are able to provide cutting-edge solutions for numerous industrial applications. All of our bonding services are also compliant with electrostatic sensitive components. Our prototype and production run capabilities are generally two to four weeks, however quicker turnaround times are available upon request. For more information on our heatsink to circuit board bonding abilities, see the table below or contact us directly.